Where do I begin? You were a brother to myself, Jackie and Stephen, a son to Mom and Dad and you enjoyed a life full of love and character. For the past fourteen years, you brought such joy, smiles and true companionship to all of us. Mom sent me this picture taken of you last Tuesday – typical you! You loved to roam and lay in the grass and never wanted to come in. 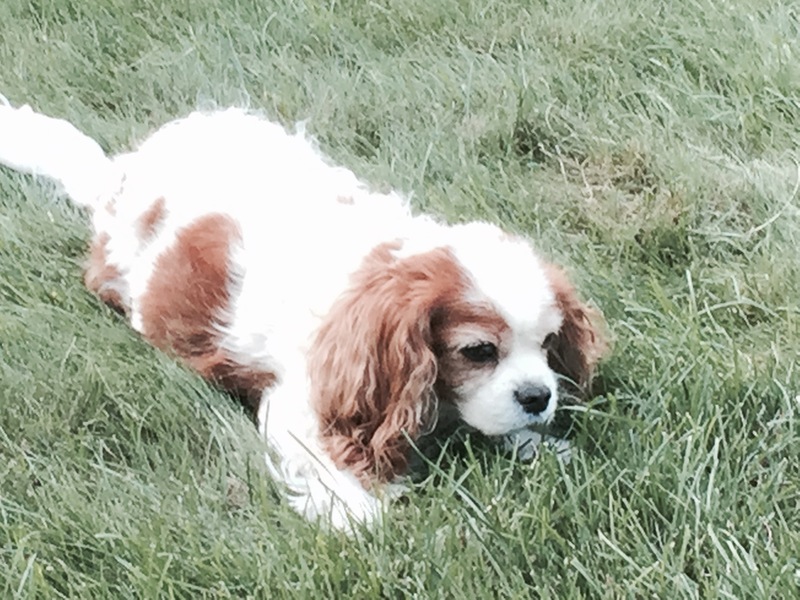 And now, I hope that you have found a lush patch of grass in Heaven that you can lay on permanently. Thank you for always being such a loyal friend and companion to us all. I have so many good memories with you that it is hard to pick which ones I want to tell you about. I will always remember the day that we brought you home, how small you were. I will never forget the countless hours that I spent with you when you first came home, lining up your food toward the bowl. You would eat each piece one-by-one and then eventually, you would lick the bowl clean. I will also always savor the times that you heard my car turn into the driveway and race to the door to anxiously sit there, waiting for me to come in and you would give me the best greeting ever. Or how about car rides – you loved the feel of your ears and hair blowing in the wind. And I know you’re a dog, but you loved beer and I hope they have some for you up there! There were trips with us to the Christmas tree farm! But for as long as I live, I will always remember the times spent on the couch when you jumped up and curled yourself into my lap. I honestly don’t know who loved it more, you or I? On July 1, 2008, I got the phone call with my MRI results. Amidst the flurry of emotion that day, I neglected to give you your birthday present and I told Mom and Dad during my hospital stay that I was afraid I would never be going home and would potentially never see you again. When I finally got home on July 15th, I cried from joy and euphoria and you were there to greet me. I finally got to give you your birthday present! Saturday morning, when Mom and Dad called me with the news, I went and sat on the deck to reflect on your life and the joy that you brought us over the past fourteen years. As all of the happy and fun memories ran through my mind, I was overcome by emotion and I looked up at the sky and the sun and said a prayer for you. By the time I looked back down at the table and opened my eyes, and with Ashley as my witness, there she was, just staring at me. I was in shock and awe. I know this was a sign from you, telling me that you were finally at peace after suffering for the past two months. 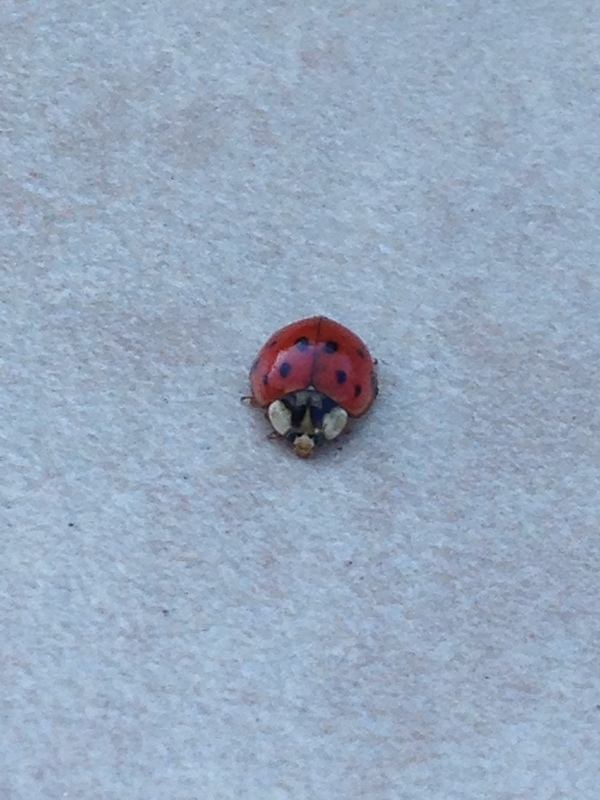 I began to cry some more because of the coincidence of seeing another ladybug in the time of need. You sent us all the sign that we needed. Another ladybug, another sign from above. Just like Dad witnessed during my neuropsychological testing when he prayed for a sign that I would be okay, or when I went for my last MRI in April that there would no evidence of growth and the ladybug appeared in Dad’s office, this was my sign letting me know you were at peace. A great reaffirmation that we made the right decision in designing the logo for the Cusano Family Brain Tumor Fund. We will all miss you and always cherish the times spent with you. You made our family better, and I thank you for that. Rest in peace, Chip. As we were driving to his office, I did not have a good feeling. The unknown was killing me and we needed an answer. We walked right into his office and Dr. Spector did not pull any punches. I could not speak, there was no saliva in my mouth. I felt my heart was racing and my legs suddenly felt very unstable. I hugged Chris and we both cried but immediately, we went on the offensive. After enduring the mysterious double vision and headaches, we now knew what we were fighting and I honestly believed that he was going to be alright. The battle was excruciating, full of ups and downs with many more unknowns, and it will continue throughout Chris’ life. I tell you this piece of the story again because my family and I have now chosen to continue to fight the war on brain tumors and brain cancer. It is the reason that we now do these fundraisers. If I can alleviate the pain that some other parent and child may have to go through by the efforts of these fundraisers, then all of this work is well worth it. I have a new found respect for fundraisers and directors of corporate relations because fundraising is not an easy task. No matter how noble the cause is asking for donations, raffle gifts, favors or attending an event, it is never easy. We are all so busy with our own schedules and we all have our causes that we want to support. But our cause is true in spirit. We know the pain of this disease, and what it can do to the individual and the family. 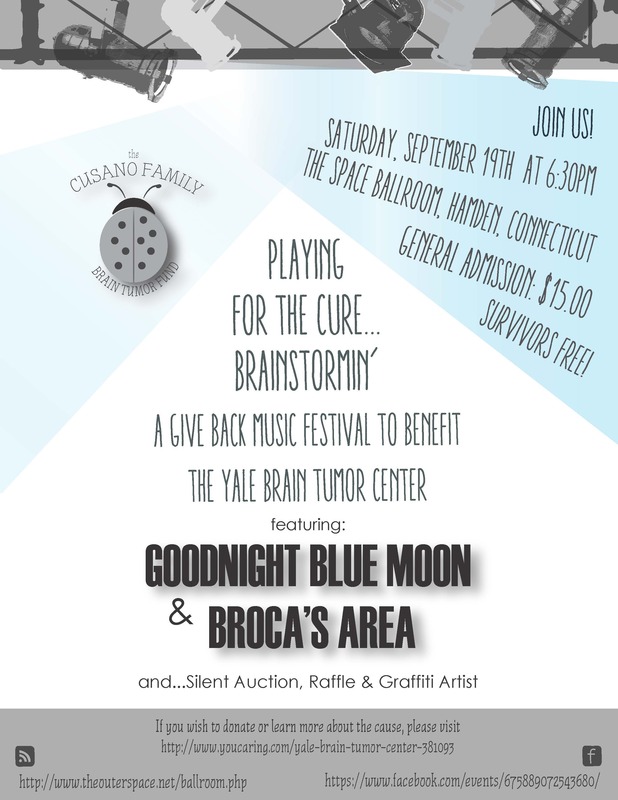 One hundred percent of the money raised is donated to the Yale Brain Tumor Center where the money is used to promote better brain tumor treatment options and support clinical and laboratory research to find a cure for brain tumors. It is nice to know where the money is going and what the doctors are doing with it in their efforts to learn about the tumors and stop the disease from affecting families like ours. We are so close to our goal for this years event. I thank all of our family, friends and business organizations who have donated this year and in the past, but additional support would go a long way in assisting now and in the future. If you can make a donation, if you can donate a raffle gift, but most importantly if you can attend the concert on September 19th, we would greatly appreciate it. The brain tumor community lost another warrior last week, Martin Syndomin. I will always remember my first CTBTA walk meeting last year. Along with Directors, volunteers, Ashley and I, there was Martin – I felt an immediate connection with him. He was a young brain tumor survivor who worked in finance in New York City, but his passion was volunteering for the Connecticut Brain Tumor Alliance. With the first ever Path of Hope last year, he was instrumental in assisting with the financials, registration site and site visits, among others. But what stood out to me was his passion for just being there and lending an ear to myself and other new volunteers. I remember him giving my wife and I the biggest hug after that first meeting – the most genuine and sincere “It’s so nice to meet you” I’ve ever experienced. Martin, you will be sorely missed but your fight will carry on. I can promise you that I will continue my pledge to help find the cure and develop new treatments in the fight against this terrible disease. When we suffer the loss of someone, we often express our grief by saying our “hearts are heavy”. It’s certainly an accurate description, however after Martin’s loss, I felt a little differently. My heart is heavy, but it’s full. Full of realization and fight. Full of renewed energy to live a life others so valiantly lost. There is a lot of current promise out there to make me feel like this is not some lofty, far-fetched hope. I look at the work of the CTBTA; I look at the National Brain Tumor Society and the American Brain Tumor Association; I look at the work and promising research being conducted at the hospitals around Connecticut. Great things are happening and it should leave brain tumor and brain cancer patients feeling hopeful. Together, this all makes me believe that finding the cure is certainly within reach in the not too distant future. And while as a community we are working to reach this goal, there is something we can all do a little better. Appreciate. Enjoy. Smile. Laugh. Of course it’s not all perfect. So when life hurts, cry. Cry the ugly cry if you have to. Don’t hold back on anything. There’s no judge or jury needed. I’m often guilty of zeroing in on nonsense, guilty of not truly living. So, for me, for Martin, for everyone, I ask one thing.